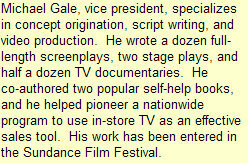 G. Donald Gale, president, specializes in the written and spoken word. He was a professor, editor, book publisher, freelance writer, and broadcast executive. He wrote six thousand on-air commentaries, a thousand speeches, two hundred news- paper columns, TV documentaries, and half a dozen books. 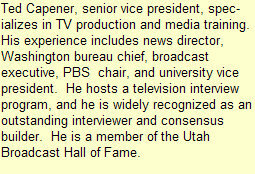 He has a Ph.D. in communications and was inducted into the Utah Broadcast Hall of Fame.